Linear Fisheries/Pike Anglers of Great Britain Junior Pike Match. 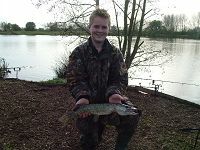 R. Benwell with one of his 5lb+ fish. Drawing for swims at the start!! 3rd place overall went to M.Wigham. R.Benwell collecting his trophy and prizes. The biggest fish on the day 9lb 14oz to J.Dent. Linear Fisheries / Pike Anglers Club of Great Britain Junior Pike Match. The annual Linear Fisheries / Pike Anglers Club of Great Britain junior pike fishing day was this year held on Manor Farm lake on Saturday 12th November. The event was organised by Linear bailiff Basil Hopkins with the assistance of head bailiff Roy Parsons and the Pike Anglers Club of Great Britain. A total of 27 keen junior pike anglers attended on the day and although the fishing was hard a number of pike were landed to just short of double figures. Help and advice for the juniors was provided on the day by Nige Williams, Martin Bowler, John Everard and Mark Ackerley from the PAC. Each junior went home with a generous goody bag of prizes, the organisers would like to thank Drennan International, Harris Sportsmail and the PAC for their donations on the day.